Ever since I was little, I have been playing soccer. It started out as just a hobby, but the more I played and the more I trained, the more I fell in love with the sport. I think soccer is the best sport to play and one of the most challenging sports as it can be quite difficult and physically exhausting to be running almost non-stop. While most people prefer playing striker or midfield, I have always been drawn to the defensive line. I believe defense players do not get the credit they deserve, as their job is one of the hardest. As a defender, you must be willing to block extremely hard shots and to always get the ball out of your end to relieve pressure on your goaltender. 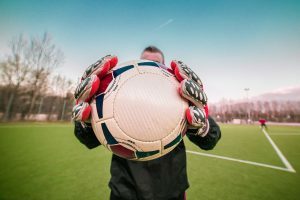 While this may seem easy to most people, it is not; even though most defenders aren’t goal scorers, they are some of the most valuable assets to a great team. To become a fantastic defender, you need to train on your defensive soccer skills. As with any sport, or any talent for that matter, you must continue to train and do drills to enhance your skills during a game. I have included my favourite drills below for you to work on your defensive soccer skills. If you stick to these, and concentrate and commit to them, I promise you will see a huge difference in your playing ability. If you are defending, you kick the soccer ball to two offensive players. Now, it is up to you, as the defender, to try and win the ball back between these two players. If you get the ball, it is up to you to clear it and get it out of your zone. It is up to the two offensive players to do their best to get past you and score. Whichever player scores a goal, or loses the ball, now becomes the defense player and everyone rotates. This will improve both your offensive and defensive skills of tackling, passing, and shooting. First divide into two teams and give everyone a number. Before each “round,” the coach (or whoever is in charge) yells out a number or two, and that person (s) is automatically offensive, the rest are defensive. Make it a standard rule that no one is permitted to tackle, and can only take the ball from the opponent by using their feet! This one is very basic, but also integral to improving your defensive soccer skills. Simply set up a cone 10 yards away from the offensive player. The offensive player will then pass the ball to the cone and it is up to the defender to run in as fast as they can to intercept the pass. This just prepares your muscles mentally for intercepting passes during a game. Spilt the team up into groups of four and give each group two balls. Two of the players are the “servers” and can corner kick the ball to their one teammate, who is on the offense. It is up to the other teammate to be the defender. Then switch, and the person on defense now becomes on offense, and their server delivers the ball. Keep rotating and repeating so everyone gets a chance! Spilt your entire team in pairs, and each pair gets one ball. Set up a cone between the two players. This cone acts as the “goal” line. Now each defensive player will defend their goal, while the offensive player tries to score on them. Keep switching every few minutes to each get a turn. This is a great one for blocking shots and learning how to stand in the way of a difficult shot. As I stated before, it is integral for any soccer player to commit to practicing his or her drills every day (with a day or two off) of the week. It takes commitment, perseverance, and a strong ambition to become a fantastic defensive soccer player. Commit to these drills and I promise you will start to see impressive results in your defensive soccer skills!